The creation of a Chinese Green Card in 2004 was a milestone in the country's immigration law. Five years on, the card is an increasingly sought-after document. On August 15, 2004, the Regulations on Examination and Approval of Permanent Residence of Aliens in China created a Green Card system granting qualified foreigners the right to live in China permanently. 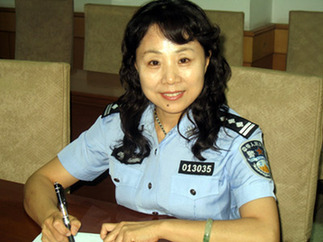 Liu Lili, who works in the Exit and Entry Administration of Beijing Municipal Public Security Bureau, has watched the Green Card system develop since its inception. She said nearly all applications received by the Bureau are approved. So far, 323 people have been granted a "Green Card" qualifying them for permanent residence in Beijing. Another 15 are awaiting final approval. It takes around 6 months to process each application. Of the 323 Green Card holders, 94 are wives or husbands of Chinese citizens; 50 are minors dependent on their parents; 20 are senior citizens returning to live with relatives; 114 are individuals who have made outstanding contributions or are of special importance to China (another 7 are their family members); and 23 are high-level foreign personnel who hold posts in businesses (another 15 are their family members). Liu said the authorities had been granting residence to returning senior citizens for some time before the Green Card system was formally launched. The government has approved permanent residence for over 3,000 foreigners since the implementation of the Law on Control of the Entry and Exit of Aliens which was adopted by the Standing Committee of the National People's Congress in November 1985. Four groups of people are eligible for permanent residence: high-level foreign personnel who hold posts in businesses that promote China's economic, scientific and technological development or social progress; foreign citizens who make large direct investments in China; persons who have made outstanding contributions or are of special importance to China; and people who come to China to be with family, such as husbands and wives, minors dependent on their parents, and senior citizens dependent on their relatives. Liu told China.org.cn that most applications she dealt with were from American citizens. Why do overseas citizens apply for permanent residence status in China? The main concern, said Liu, is the political factor. Once people have a "Green Card", they feel they are accepted and trusted by the Chinese government. The "Green Card" also facilitates entry and exit. With permanent residence status, visas are no longer needed and people can enter and leave the country using only a valid passport. China offers outstanding career opportunities and is seen by many as safer and more secure than many other countries, said Liu. 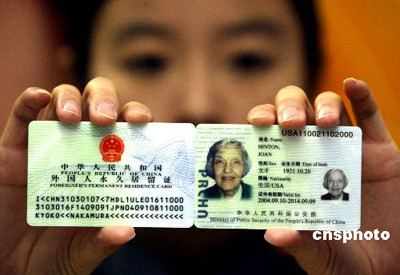 Liu said that Green card holders have the same rights and responsibilities as Chinese citizens. However the card is not equivalent to Chinese nationality and holders are not allowed to vote in elections, hold political office, or serve in the military. Obtaining a Green Card is not easy. The qualifying conditions are tough. Unless you are a close relative of a Chinese citizen you will either have to invest a substantial amount of money in the country or make a genuinely outstanding contribution to the country's development. To meet increasing demand, the authorities are considering making the Green Card more available by broadening the range of applicants without lowering the requirements, said Liu, but she gave no further details.